Dave Webb is an active local resident and Director of the Greening Wingrove CIC. A pioneer of Vertical Veg Street, he was also part of the team successful in bidding in this years’ Community Innovation Funded (CIF). Dave is a strong advocate for change in the area. Growing runner beans! This compares to my attempt to grow raspberries, which is pitiful. I’ll keep trying (and they’ll keep dying). 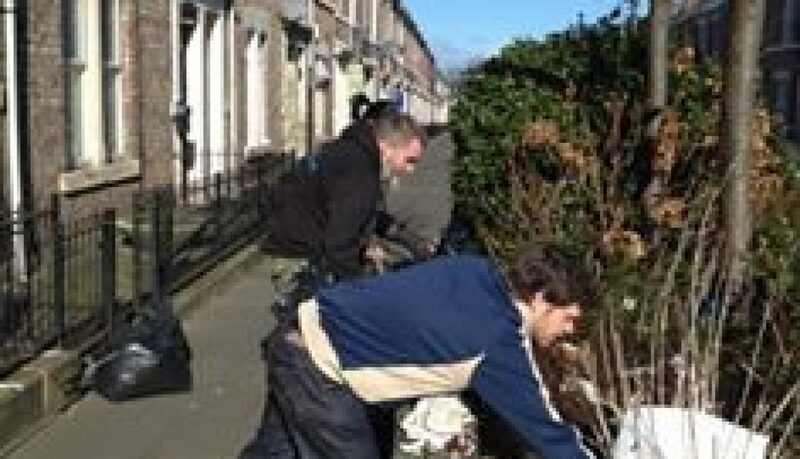 Don Morrison singing a “he’s our leader” song during a community clean up session with Nigel Todd. What’s got you excited right now? Our successful CIF project ‘Reclaim the Lanes’, aims to improve the back lanes as spaces for socialising and kids to play in safely. At our next event, we’re hoping for an experimental mix of DIY musical instrument making, creating wall hangings and some very special outdoor food. 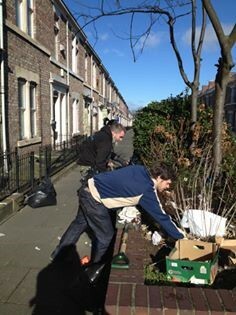 We want people to bring their bins along and start to clean up the street so we can have more fun! Favourite landmark in the Greening Wingrove patch? The Nuns Moor Park Community Garden, or it will be. I’m hoping it’ll become a base for musicians and local residents using the park. Pretty much everything! The challenge at the moment is to keep moving forward and to generate some income to sustain all this in the future. As always, we need more hands on deck, so get in touch if you have ideas and/ or want to help out.